Cost effective and maintenance free. The Series 4700 Spun Aluminum Pinch Valve is designed for low pressure service, in control or on/off applications. The Series 4700 is similar to the Type A, but the body is constructed entirely of spun aluminum for weight savings and easy installation. The air actuated Series 4700 is ideal for O.E.M accounts, Gravity Flow Applications, Pneumatic Conveying Systems and Waste Treatment Plants. The Series 4700 Pinch Valve’s unique design makes them the most cost effective, maintenance-free automatic valves available. The key to this valve is in the flexible reinforced rubber sleeve – the valve’s only wetted part. Actuation of the valve, the pinching action, is accomplished by air or hydraulic pressure placed upon the sleeve. The valve body acts as a built-in actuator, eliminating costly pneumatic, hydraulic or electric actuators. Adding air pressure within the annular space between the housing and sleeve can open, throttle, or close the valve. In general, 25 psi over line pressure is required for full closure. The sleeve’s flexibility allows the valve to close “drop tight” around entrapped solids, eliminating “hang ups” without ever damaging the valve itself. Sealing area is equal to 95% of the valve’s length. With the Series 4700, there are no seats or packing to replace, cavities or dead spots to collect debris and bind valve operation. When the valve is open, it is like a straight piece of pipe in the line. These valves are used in remote locations or harsh environments since there are no external links, levers, pistons, or rotating parts to cause downtime, and can even be buried underground. 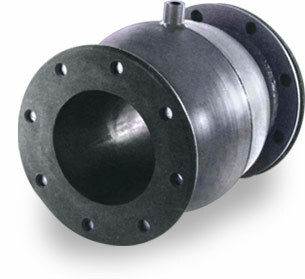 When installing the Series 4700, it is recommended that galvanized steel back up rings be used behind the valve flanges.